Real Madrid captain Sergio Ramos says it is disrespectful to talk about whether Jose Mourinho could return to the club as they prepare for the Club World Cup final with Al Ain. Santiago Solari will win a first trophy as coach if they win on Saturday. However, Mourinho is available after being sacked by Manchester United. 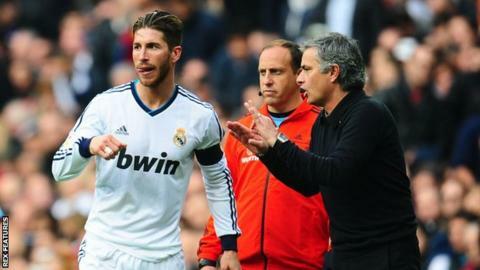 "People need to show more respect to the coach we have now," Ramos said. "Mourinho left us five years ago yet everyone keeps talking about him." The Portuguese managed Real from 2010 to 2013, winning La Liga in 2012. He still has a good relationship with Real president Florentino Perez. Real - who sacked Julen Lopetegui in October - are bidding to win the Club World Cup for the third season in a row. They reached the final courtesy of Gareth Bale's hat-trick in Wednesday's semi-final win over Kashima Antlers. "I'm not the person who decides which coach comes here or doesn't. Some people seem to think that the captains decide which coach Real Madrid appoints," said Ramos, now playing under a 12th Real manager in Solari, who was appointed in November following a caretaker spell. He is hoping they can make history on Saturday as the first team to win four Club World Cups. "No-one can doubt the record of any one of us and we have another chance to defend the Club World Cup title," Ramos added. "No-one has ever done this. We are looking forward to the final with hope and we want to go home with the prize. It would be great for us on an emotional level to come back with the trophy." You can follow live text commentary of Saturday's final on the BBC Sport website. Kick-off is 16:30 GMT.